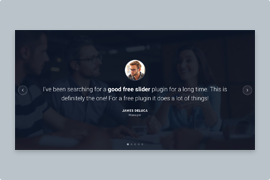 Description: Thumbnails are great to show visuals on your slider. Showing the company logos you've worked with helps to increase trust in your buyers. 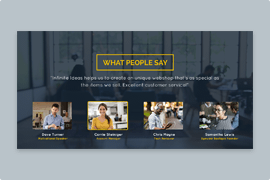 The Testimonial Thumbnail slider is another great example of how the slider background works. The slider background image stays static behind all slides, so only the content moves in front of it. This creates an appealing effect, and makes the slider look fresh. This is a colorful slider: there are two font colors and there are logos which have lots of other shades. Before we dig into the slide navigation, let’s see what kind of content each slide has. The slides were built using Content mode to make them responsive with minimal effort. There are three layers: a heading, a text and a button. The heading layer has pinkish color and smaller font size. It displays the name and occupation of the customer. The color brings attention to the text as it’s always important to know who has written the testimony. In the middle of the slide there’s a text layer, with light color and big font size. It contains the actual testimonial text. Thanks to the large font size, it’s easy to read for all audiences. The last layer on the slide is a Read more button. 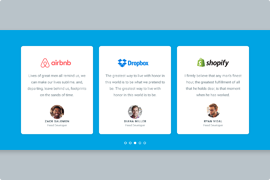 It’s very useful when you have a long text and you only highlight a small part in your testimonial slider. 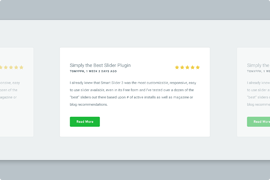 The slider navigation is the most special part of the Testimonial Thumbnail slider. There are three ways to do it: using arrows, thumbnails or dragging. The dragging is the most straightforward action, especially for mobile users. On desktops, the grab icon helps learning about this feature. The arrows are special, too. By default there’s a white arrow, which has a light background and a slightly darker border. When you hover the arrow, the background and border color changes. Instead of the opaque white, they now have the pinkish color which the first heading layer has. (The same color change happens when you hover on the button.) 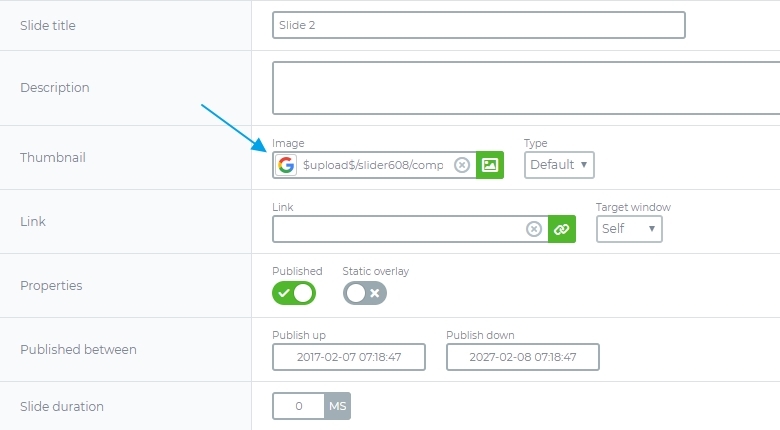 The primary feature of the slider is the thumbnails at the bottom. They show the company logo which the customer works for. The thumbnails help with the navigation while showing how many slides there are to see. Of course, you can change them to the user’s avatar.